← [Mystery Box] Matrimonio Floral ! For a week, you intrigued, plotted, manipulated, fought and worked in secret to place your favorite Family on the Throne! Who emerged victorious from the battle between these 5 Families? Who will crown his heir on the Dethrones and be the head of the kingdom? Today, you have decided to place the fate of Féereéal in the hands of the powerful Pagayrian Family, let Fire and Blood regain their long lost glory! But still it will be necessary to keep an eye on the other Families, they may be trying to stage a coup d’état … but in the meantime, the Fallen Family has regained its wings and the rightful place. Glory to the Pagayrians and to the new Queen! Generous, she will know how thank those who helped her in regaining the throne by granting them her royal favor. 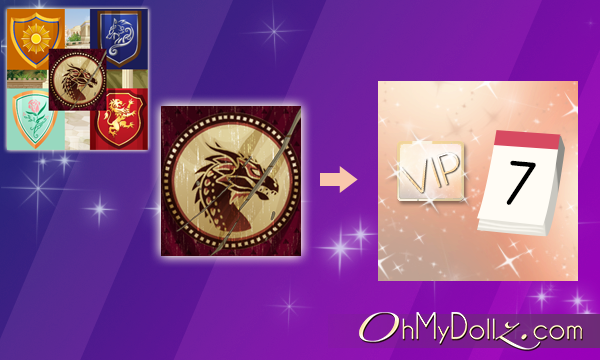 If you have completed this Family 100% during the Game Dethrones event, you will be credited with a Week of VIP Subscription! If you are already a VIP subscriber, 7 additional days will be added to your total remaining days. If you are already a VIP subscriber with the weekly pre-paid subscription, 400 fee’z (weekly value) will be added to your account.